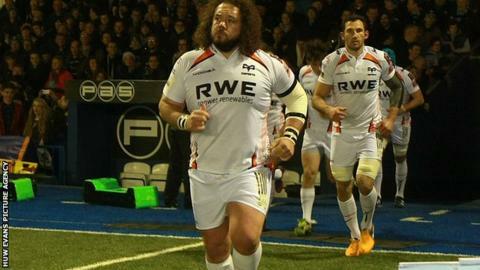 The future of Wales tight-head prop Adam Jones is still in doubt, admits Ospreys head coach Steve Tandy. The British and Irish Lion is out of contract in the summer and has been at the centre of a contract row between the Ospreys and the Welsh Rugby Union. Jones, 33, has stated he wants to stay in Wales but contract talks with the Ospreys have stalled after claims the WRU has been in talks with him. "There is no news and it is what it is," said Tandy. Born: 8 March 1981 in Abercrave in the Swansea Valley. Club rugby: Neath (1998-2003); Ospreys (2003-). Won Celtic League 2004-05, 2006-07, 2009-10, 2011-12. Wales: Debut v England in 2003 Six Nations. Won 94 caps. Grand Slams in 2005, 2008 and 2012. Lions: Toured in 2009 and 2013, winning five caps. "It's something that is part and parcel of Welsh rugby at the minute. "It is something we have to get on with and we have plenty of things to focus on and the talent that we have got coming through at the Ospreys." Ospreys chief Andrew Hore has accused the WRU of breaking an agreement not to negotiate a central contract with Jones. The region have offered the tight-head a new deal but Hore claims the WRU has been discussing terms with Jones. Jones, who has won 94 Wales caps, was one of six players whose contracts were due to expire who the WRU made a priority to try and keep in Wales. Blues and Wales full-back Leigh Halfpenny is the only one of the six to opt to move away from Wales, having signed a contract to join Toulon for the 2014-15 season. Two-time Lions tourist Jones, whose contract with the Ospreys ends in May, has previously said he will probably stay in Wales.